Recognition for your extra and co-curricular activities? Access to a free online personal development programme? A transcript of your achievements to show future employers? 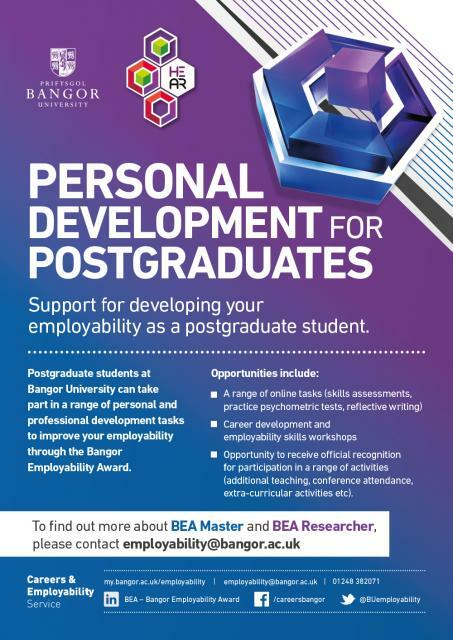 The Bangor Employability Award is available to all students on postgraduate taught courses; it offers a personal professional development programme and enables you to record your participation in employability-related activities and events that enhance your skills and abilities. The scheme is flexible, and is designed to complement and fit around your academic commitments.